Eddystone Installation Notes Operating Instructions and Service Data Model 1000 and 1001 [General Purpose HF/MF Communication Receivers]. 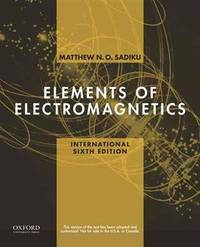 From Elements Of Electromagnetics to Elements Of Electromagnetics, from	Active and Passive Analog Filter Design to Applied Digital Control, we can help you find the electrical engineering books you are looking for. As the world's largest independent marketplace for new, used and rare books, you always get the best in service and value when you buy from Biblio.com, and all of your purchases are backed by our return guarantee. Published by George Newnes Ltd., Tower House, 8-11 Southampton Street, Strand London Second Revised Edition 1950. London 1950., 1950. Hard back binding in publisher's original peach cloth covers, black title and author lettering to the spine and the upper panel. 8vo. 6½'' x 4¼''. Contains [viii] 135 printed pages of text with monochrome illustrations throughout. Without any ownership markings. Very Good condition book, in near Very Good condition dust wrapper with small tears to the top of the front cover, not price clipped 5/-. Dust wrapper supplied in archive acetate film protection, this protects and prolongs the life of the paper, it is not adhered to the book or to the dust wrapper. Member of the P.B.F.A. London: Archibald Constable & Co Ltd. G : in Good condition without dust jacket. Cover rubbed. 1908. First Edition. Green hardback cloth cover. 210mm x 140mm (8" x 6"). xviii, 321pp. . Published by William Collins Sons & Company, London and Glasgow 1876. 1876., 1876. Hard back binding in publisher's original dark green cloth covers. 8vo 7" x 5" 176 pp. 120 monochrome illustrations. Pencil name and notes verso to front end paper, general light soiling and rubbing to cloth covers and in Very Good condition. Member of the P.B.F.A. London: Percival Marshall & Co. G : in Good condition without dust jacket. Cover rubbed and soiled. Staples rusted. . 14th Edition. Paperback. 190mm x 130mm (7" x 5"). 54pp + ads. . Published by Odhams Press Limited, Long Acre, London Third Edition 1959. 1959., 1959. Third edition hard back binding in publisher's original burgundy rexine covers, gilt title and author lettering to the spine. 8vo. 8½'' x 6''. Contains 479 printed pages of text with monochrome illustrations and diagrams throughout. Tiny rubs to the spine tips, foxing to the closed upper and fore edges. Very Good condition book in Very Good condition dust wrapper with shallow nicks and rubs to the upper edges and corners. Dust wrapper supplied in archive acetate film protection, it does not adhere to the book or to the dust wrapper. Member of the P.B.F.A. Boca Raton, London, New York, Washington DC: CRC Press, 2001. First Edition. Boards. Near Fine. First Edition. , 348 pages. 8vo. Printed glossy boards. A crisp clean copy with a touch of rubbing to the covers. Boards. Published by George Newnes Ltd., Tower House, 8-11 Southampton Street, Strand London 1942 Reprinted Edition [First Edition 1940]. London 1942., 1942. Second edition hard back binding in publisher's original green cloth covers, gilt title and author lettering to the spine and the upper panel. 8vo. 7½'' x 5¼''. Contains [viii] 216 printed pages of text with 125 monochrome diagrams and photographs throughout. Very Good condition book, in Very Good condition dust wrapper with shallow rubs to the corners and tips, not price clipped 7/6. Dust wrapper supplied in archive acetate film protection, this protects and prolongs the life of the paper, it is not adhered to the book or to the dust wrapper. Member of the P.B.F.A. London: Chapman & Hall Ltd, 1963. Later printing. Boards. Very Good. Later printing. xix, [1-blank], 555 pages plus 25 plates in rear on glossy paper. 8vo. Publishers original paper covered boards, spine lettering bright and readable. Previous owners' name written in several places, otherwise clean. A sound working or reference copy. Boards. A primary reference in the field, the 'bible' of vacuum deposition. Published by Cassell & Company Ltd., 37-38 St. Andrew's Hill, London First Edition 1900. 1900., 1900. First edition hard back binding in publisher's original duck egg cloth covers, red title and author lettering to the spine and to the front cover with black decoration. 8vo. 7'' x 4¼''. Contains 160 printed pages of text with monochrome engravings and diagrams. Spine ends and corners soft and in Very Good condition, no dust wrapper, 1/- to the front cover. Member of the P.B.F.A. Washington, D. C.: The Proceedings Publications Committee, 1954. First Edition. Wraps. Good. First Edition. xii, 224 pages. 8 1/2 x 11 inches. Worn, corners turned, several penned notes on front cover, a well thumbed copy. Signed on the front page by H. Stockman, a presenter from Scientific Specialities Corporation. Wraps. This conference is unlike most we've seen in the early computer period. It relates to components, the pieces with which one manufactures the equipment. The transistor was invented at Bell Labs in 1948 and immediately the implications of it became clear. Smaller footprint than vacuum tubes, potentially greater reliability, and a strong interest from the military. Those same themes come through in this symposium. The first 3 introductory speakers are from the military. Many speakers opine on reliability or lack thereof and how to get better. We have a group of material we've coined "the commercialization of the transistor" (offered elsewhere). This symposium highlights many of the same things - a practical, real world application drives innovation and understanding. While much of the presentations made are very technical in nature, the goal is clear - commercialize, as soon as possible, small reliable components. For someone studying the state of the industry from a technical perspective, this is a useful item. Many of the research players are present : Bell Labs, Sprague Electric, Motorola, Western Electric, RCA, GE, Raytheon, etc. Learn about metal whiskers if you dare! Published by Sony Corporation 1973 - 1977. 1973., 1973. Original stapled white paper covers [soft back]. 4to 12'' x 8¼''. Contains 16 printed pages of text with monochrome illustrations and photographs throughout. In Very Good clean condition, no dust wrapper as issued. Member of the P.B.F.A. Fort Wayne, Indiana: Fort Wayne Electric Works, 1907. Staplebound. Good. 8 pages, stapled and two-hole punched. 8 x 10 1/2 inches. Page edges trimmed and then stained red, in this case bleeding onto the front page of the bulletin. Staplebound. The second edition of this bulletin. Illustrated. Discusses the generators in use and advantages of different equipment approaches. Dubrovnik: Publikacija Pomorskog Odjela. VG : in very good condition without dust jacket as issued. 2004. [First Edition]. Illustrated hardback laminated board cover. 240mm x 170mm (9" x 7"). xi, 206pp. Foreign (ie, non-English) text throughout. . Published by Chapman and Hall Ltd., 11 Henrietta Street, London First Edition 1951. London 1951., 1951. First edition hard back binding in publisher's original cobalt blue cloth covers, gilt title and author lettering to the spine. 8vo. 8½'' x 5½''. Contains 285 printed pages of text with monochrome diagrams and formulae throughout. Spine ends and corners soft with shallow rubs, ink name to the closed upper edges and front free end paper. Very Good condition book in near Very Good condition dust wrapper with small chips to the spine ends and corners, not price clipped. Dust wrapper supplied in archive acetate film protection, this preserves and prolongs the life of the paper, it is not adhered to the book or to the dust wrapper. Member of the P.B.F.A. Published by George Newnes Ltd., Tower House, 8-11 Southampton Street, Strand London Fourth Edition 1949. London 1949., 1949. Fourth edition hard back binding in publisher's original peach cloth covers, black title and author lettering to the spine and the upper panel. 8vo. 6½'' x 4¼''. Contains [viii] 120 printed pages of text with 105 monochrome illustrations throughout. Without any ownership markings. Very Good condition book, in Very Good condition dust wrapper with light soiling to the paper, not price clipped 5/-. Dust wrapper supplied in archive acetate film protection, this protects and prolongs the life of the paper, it is not adhered to the book or to the dust wrapper. Member of the P.B.F.A. Published by Sir Isaac Pitman & Sons Ltd., Parker Street, Kingsway, London First Edition 1926. London 1926., 1926. First edition hard back binding in publisher's original navy blue cloth covers, gilt title and author lettering to the spine and to the upper panel. 8vo. 7½'' x 5¼''. Contains 126 [23 Publisher's Catalogue] printed pages of text with monochrome diagrams and photographs throughout. Rubs to the spine end and corners, ink name to the end papers and in Very Good condition, no dust wrapper. Member of the P.B.F.A. Published by T. C. & E. C. Jack Ltd., 35 Paternoster Row, London circa 1931. 1931., 1931. Hard back binding in publisher's original tan cloth covers, black title and author lettering to the spine and upper panel with photographic paper onlay. 8vo. 8'' x 5½''. Contains 296 printed pages of text with colour illustrated frontispiece and monochrome illustrations and photographs throughout. Spine ends and corners turned in with shallow rubs, bookplate dated 1931 to the front free end paper and in Very Good condition, no dust wrapper. Member of the P.B.F.A. Published by Macmillan & Co., Limited, St. Martin's Street, London First Edition 1934. London 1934., 1934. First edition hard back binding in publisher's original racing green cloth covers, gilt title and author lettering to the spine. 8vo. 7½'' x 5¼''. Contains 204 printed pages of text with monochrome diagrams, graphs and formulae throughout. Tiny rubs to the softened spine ends, ink name to the front paste down and free end paper, age darkened closed edges and in Very Good condition, no dust wrapper. Member of the P.B.F.A. Published by Odhams Press Limited, Long Acre, London Third Edition 1960. 1960., 1960. Third edition hard back binding in publisher's original light blue cloth covers, gilt and navy blue title block to the spine. 8vo. 8½'' x 6''. Contains 479 printed pages of text with monochrome illustrations and diagrams throughout. Lower spine end softened. Very Good condition book in Very Good condition dust wrapper with tiny nicks to the upper spine end and gutters, crease lines to the lower spine end, not price clipped 21s. Dust wrapper supplied in archive acetate film protection, it does not adhere to the book or to the dust wrapper. Member of the P.B.F.A. Published by The Trader Publishing Co., Ltd., London First Edition 1949. London 1949., 1949. First edition hard back binding in publisher's original letterbox red cloth covers, gilt title and author lettering to the spine. 8vo. 8½'' x 6''. Contains 150 [xiv publisher's illustrated catalogue] printed pages of text with monochrome diagrams throughout. Spine ends and corners scuffed, ghosting to the end papers. Near Very Good condition book in near Very Good condition dust wrapper with wear to the spine ends and upper edges and corners. Dust wrapper supplied in archive acetate film protection, it does not adhere to the book or to the dust wrapper. Member of the P.B.F.A. Published by The Wireless World, Iliffe & Sons Ltd., Dorset House, Stamford Street, London circa 1928. 1928., 1928. Hard back binding in publisher's original maroon cloth covers, gilt title and author lettering to the spine and the upper panel. 8vo. 7½'' x 5¼''. Contains [x] 213 [xxi advertisements] printed pages of text with monochrome illustrations throughout. Very Good condition book, in scarce Good condition dust wrapper with age tanning and small chip down the spine, corners rubbed. Loosely inserted Wireless World clippings. Dust wrapper protected. Member of the P.B.F.A. Published in house by Philips Metalix Lamps Limited, 145 Charing Cross Road, London September 1935. London 1935., 1935. Original stiff thick brown card wrap covers. 8vo 10'' x 7''. Contains 46 printed pages of text with monochrome illustrations and photographs throughout describing the High Tension Rectification process. Loosely inserted is a letter from Philips Metalix dated 13th January, 1935. In very near Fine condition. Member of the P.B.F.A. Published by Whittaker & Co., London Fourth revised and enlarged edition 1892. 1892., 1892. Hard back. 125 mm x 175 mm 201 pages. Well illustrated. Name to inside front paste down. Edges with thumb marks, spine tanned, without foxing. Member of the P.B.F.A. New York: Electrical World and Engineer, 1901. Later printing. Cloth. Very Good. Later printing. xii, 627 pages. 8 vo. Publisher's brick colored cloth. Minor soiling and wear at the extremities. Front black flyleaf lacking. A sound working / reference copy. Cloth. A later printing, first published in the late 1890s.